The offices of 16 Parisian architecture studios, including Renzo Piano Building Workshop and Périphériques, feature in this set of images by photographers Marc Goodwin and Mathieu Fiol. Goodwin and Fiol, who are both from photography studio Archmospheres, documented a wide variety of architecture offices in the French capital, from one with just two employees to another with 150. As well as Renzo Piano's office, which occupies a former art gallery, and the monochrome offices of Périphériques, they also visited the workplaces of LAN and Laisné Roussel. Many of the spaces occupy adapted buildings, including a former printer of vinyl record sleeves and a scooter parking space. For instance, Architecture-Studio's conservatory-like office previously belonged to a herbalist, and has a tree at its centre. 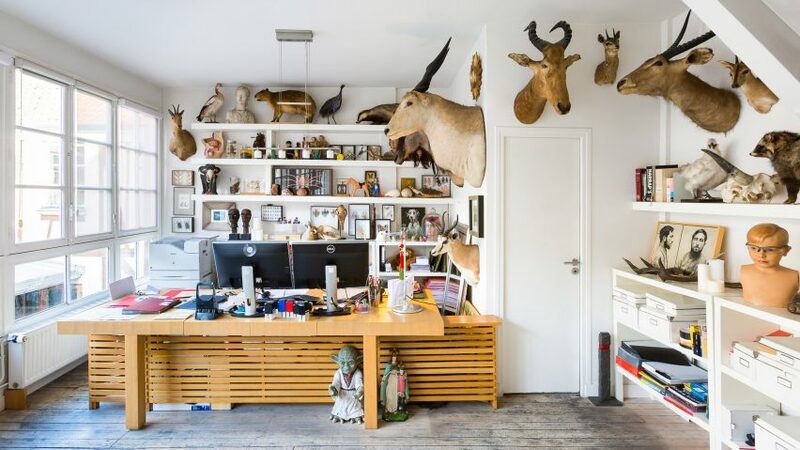 Elsewhere, glazed sliding doors open Tanya Klyne's studio to an outdoor courtyard, while the walls of Richez Associes' office are cluttered with taxidermy. For Parc Architectes, the photographers captured details including a cobbled floor, plants and statues. The images follow on from a series of photosets by Goodwin that document the studios of architects in different cities. He has previously visited the workplaces of London architects and Nordic studios.